THE SING OFF: Season 3, Insider’s Top 8 Picks! Season three of NBC’s voice competition show, “The Sing-Off” begins Monday, September 19 at 8/7c. Fans and regular viewers of the show will recognize some changes made when the new season airs. "Dartmouth Aires" - one of our top 8 picks! First of all, more groups will be competing this season than any other season- 16 groups. The show returns with a new judge, Sara Bareilles. Returning judges are Ben Folds, and Shawn Stockman. In the past two season , “The Sing-Off” has been live. Instead of viewers deciding who stays or goes, this season it’s the judges. All of the shows have been pre-taped in advanced, in fact, the show is almost completely done filming. It will return with only one live season finale show in which viewers will most likely be able to vote for their favorite a cappella group. The last change that we noticed while on the set this season – a new battle round is introduced! During the time spent on “The Sing-Off” set, we have selected our top eight group picks this season. Watch their video interviews (courtesy of NBC). Something that we found out from the interviews, many of the groups were formed via ex-Sing-Off contestants and specifically placed together specifically for “The Sing-Off” competition. This seems like a conflict of interest, and a bit unfair if past contestants are involved in the current contest. Some of the groups have never performed a cappella. Also, seems like a rule broken here. 1) PENTATONIX – They integrate mainstream influence of dance, pop, and club hits to attract the young audience. They say that a big challenge for them is that they can only use their voices to make instrumental and electrical sounds and it’s something that they’d like to pursue. 2) AFRO-BLUE – They are a jazz vocal ensemble form Howard University. Although they sing mostly a cappella, they never thought they’d be on “The Sing Off”. It was on a suggestion from “Take 6” that they be on the show. 3) NORTH SHORE – The oldest member group on the show, from Boston, Mass. They originally formed “Breaking Away” group whose popularity was big in Boston. “When the D.J’s came into the club scene, it knocked the bands out”. They say that they have learned a lot from the younger groups on “The Sing Off”. 4) DELILAH – An all girl “rock” group from Orange County, California. 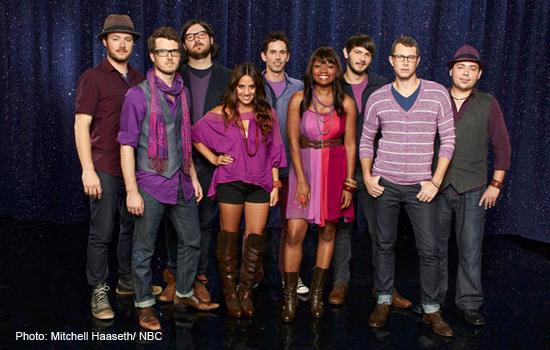 Member, Amy in the group was on season 1 of “The Sing-Off” who formed “Delilah”. Another member was in season 2. They said “Delilah” consists of girl singers from the show that they felt needed a second chance”. 5) DARTMOUTH AIRES – From Hanover, NH. 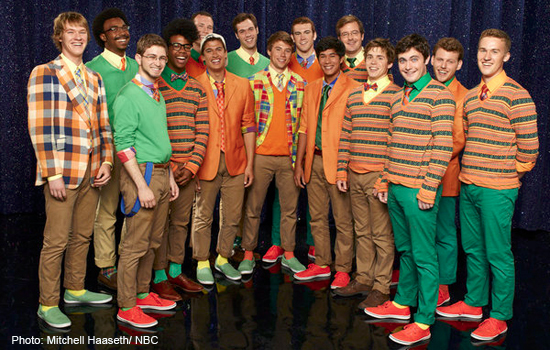 They are an all-male a capella group. Dartmouth Aires has been around for 65 years. They say that their clothing represents their “fun, lively, energetic performance” which matches with their bright colored wardrobe. 6) VOCAL POINT – A nine all-male group from Brigham Young University in Provo, Utah. I’m not surprised that they are in our top 8 picks! Brigham Young University is known for producing some of the best a cappella groups anywhere! 7) URBAN METHOD – From Denver, Colorado. They were put together by a sound engineer in Denver for “The Sing-Off”. The engineer wanted to put together a “super group. That’s how Urban Method was born”. They say that although they haven’t been together very long, “the chemistry was instantaneous”. In an interview, Ben Folds stated that “Urban Method” has a unique sound and named them as a prime example of being part of a “period of innovation”. 8. THE COLLECTIVE – From Nashville, Tenn. this is another group formed specifically to compete in “The Sing-Off”. They are unique in that they are musicians whom had never performed a cappella before. They have been together for two months and placed by Jeremany Lister (“Street Corner Symphony”) from season 2 of “The Sing-Off” who “pulled all the best singers from Nashville to see if it would work”. The group also states that being “naive” to a cappella gives them an advantage to be creative with the freedom from not worrying about breaking any rules.